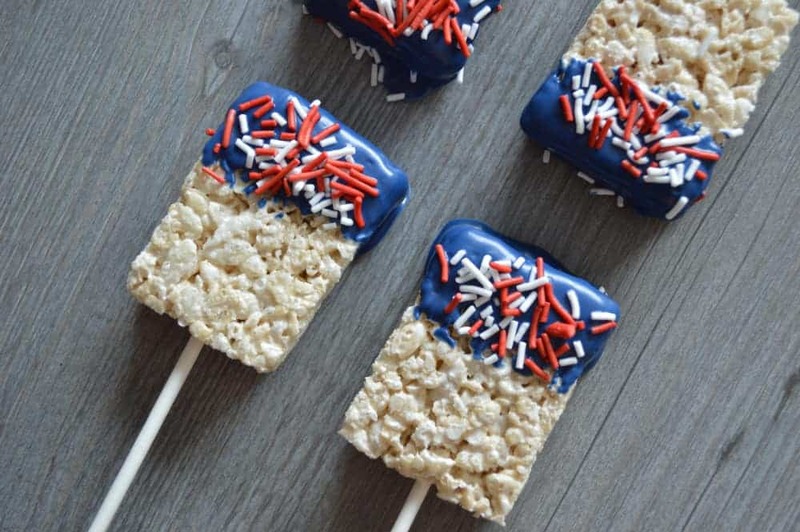 You are going to love the ease of these festive Patriotic Cereal Treats! Today I’m sharing a fun spin on a classic that everyone loves. Rice Cereal Treats are simple to whip up. I imagine a lot of folks got their start in the kitchen by making these! 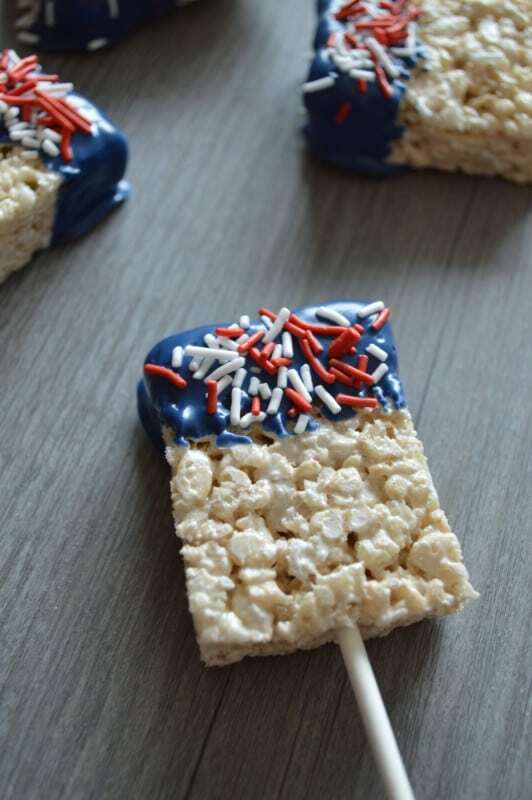 This is just a little idea for your Independence day celebration that makes them a little more of a festive treat. They are also a great way to allow the little ones to help in the celebration preparations. The recipe is simple so I’ll keep it short. What are your plans for the fourth? Do you get together with family? Does everyone bring a dish? Do you just hang out at home and go somewhere to watch fireworks? Our son’s birthday is July 6th so we usually celebrate it with the family we get to see on the Fourth, enjoy some food (sometimes simple as hot dogs, sometimes more elaborate), and just make it a great family day. Click here to see the amazing Red, White, and Blue drink that stays in layers in your glass! Line a baking sheet with waxed or parchment paper and set aside. Microwave marshmallows and butter in 30 second intervals until completely melted. Add cereal and vanilla extract and fold. Once combined, pour into a buttered-coated pan and pat it flat firmly and evenly with a spatula. Allow treats to set for at least 1 hour. Cut treats into rectangles, about 3 inches wide. In a microwave-safe bowl, microwave your candy melts for about 30 seconds. Gently dip end of lollipop stick into melted candy melts and then insert into one end of each treat. Insert lollipop stick in each treat. Dip 1 inch of each cereal treat into melted candy and lay flat on lined baking sheet. Top off with red and white sprinkles. Let set until coating hardens completely. Enjoy! This is a great idea Christy! Thanks for sharing. the patriotic cake balls link goes to the fortune cookie blog. all the others work. Love you. These look soooo neat! I have the already made individually wrapped rice krispie bars and I will be using those to hasten task! Thanks for the neat ideas for the Fourth!